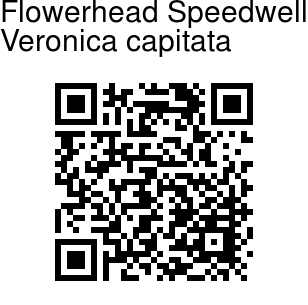 Flowerhead Speedwell is a perennial herb with pale blue or whitish flowers borne on top of the stem in a head-like cluster. Inflorescences, elongating to 5 cm in fruit, are covered with multicellular glandular hairs except for flowers. Bracts are leaflike, elliptic. Flower-stalks are short, elongating to 5 mm after flowering. Calyx is 4-5 mm, with sepals broadly linear to oblanceolate. Flowers are 8 mm, tube 1-1.5 mm, hairless inside, petals erect, ovate-circular, ovate, or narrowly oblong. Ovary tip is sparsely hairy. Stems are basally trailing, erect towards the top, simple or branched from middle, 7-15 cm tall. Leaves are stalkless, lower ones scalelike. Leaf blade is ovate-circular, 1-2 x 0.6-1.5 cm, with multicellular glandular hairs, base rounded, margin entire or obscurely toothed, tip blunt. Capsule slightly compressed; style to 7 mm. 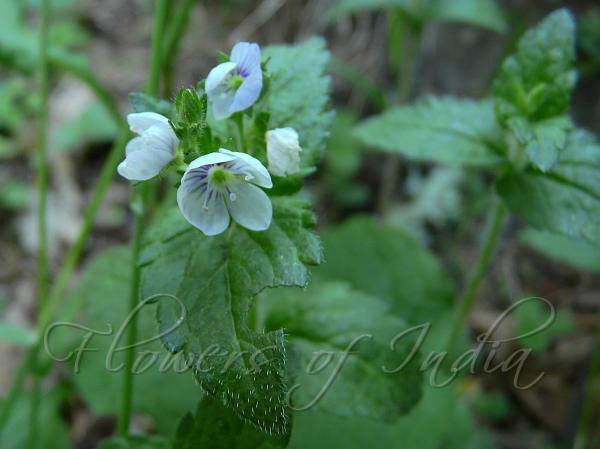 Flowerhead Speedwell is found in alpine meadows in Western Himalayas, at altitudes of 3000-4500 m.